Dubai: Nakheel PJSC’s possible non-payment of its Islamic bond due on Monday will trigger defaults on two other securities, bringing the total of affected securities to $5.25 billion (Rs24,412 crore), bond documents show. Investors are waiting to see if the Dubai state-controlled developer will pay the maturing $3.52 billion Islamic bond, known as sukuk. The Dubai government said on 25 November that state-run holding company Dubai World is seeking a “standstill" agreement on its debt, including for the Nakheel unit. The default would be triggered by failure of Nakheel, or the guarantor, Dubai World, to make payment at the end of a grace period, the documents said. Nakheel has two weeks to remedy a default and prevent bondholders from starting legal proceedings. Nakheel’s other two bonds are a 3.6 billion dirham ($980 million) floating-rate note due in May and a 2.75%, $750 million sukuk maturing in January 2011. 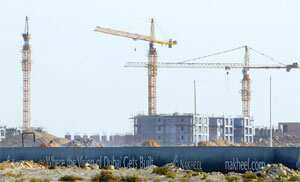 Nakheel’s bond maturing on Monday rose 1% to 53 cents on the dollar on 11 December, on speculation the developer may seek to avoid a default. The bond has dropped at least 50% since the 25 November announcement. Dubai World began talks with banks this month to restructure $26 billion of debt. Nakheel’s bond repayment is the biggest maturity for a Dubai entity since the global credit markets froze after the September 2008 collapse of Lehman Brothers Holdings Inc. Nakheel accumulated debt during a six-year real estate boom in Dubai, when the sheikhdom borrowed $10 billion and its state-controlled companies $70 billion to help diversify the economy. BNP Paribas SA and EFG-Hermes Holding SAE analysts said last week that Nakheel may repay bondholders as much as 70 cents on the dollar and issue new securities to restructure the remainder of the debt. “Such an outcome would be beneficial for both parties involved," EFG’s Dubai-based strategist Fahd Iqbal wrote in a research report. “Creditors would receive a portion of their money back with a promise for the remainder to be delivered at a later stage while Dubai World, along with other government-related parties, would have continued access to capital markets." While Dubai’s government owns 100% of Dubai World, it hasn’t guaranteed the company’s debt and creditors must help it restructure, Abdulrahman Al Saleh, director general of Dubai’s department of finance, said on 30 November. Dubai World may need more than six months to complete its debt restructuring, Al Saleh told the Al Arabiya news network. Nakheel, the developer of palm-tree-shaped islands off the Dubai coast, had a first-half loss of?13.4 billion dirhams as real estate prices crashed in the Gulf business hub. “Certain of the Nakheel Group’s financing arrangements may contain cross-default clauses whereby a default under one of the Nakheel Group’s financing arrangements may constitute an event of default under other" obligations, according to an offering circular for the Nakheel 2011 bonds on Bloomberg. Nakheel’s 2.75% bonds due in January 2011 were unchanged at 46.50 cents on the dollar on 11 December. Prices for the $750 million notes have dropped from 88.37 cents on the dollar on 24 November.